Established in 1994, Mischler Financial Group is the securities industry’s oldest minority broker-dealer that is owned and operated by service-disabled-veterans (“SDVs”). Our core competencies include investment banking services for primary debt and equity capital market transactions and best execution for institutional clients focused on domestic and international equities, corporate share repurchase (10b-18), fixed income products and rates trading. Our formation was inspired by thought-leaders from CalPERS and CalSTRS, the world’s 2 largest public pension funds. It was their vision that we all have an obligation to recognize the sacrifices made by those injured while serving in the military and to ensure that those who have served in the line of duty and seek to transition to the financial industry be provided the same opportunities afforded to other certified diversity firms operating within the financial services sector. That original “wind-in-the sail” for our firm was also intended to influence social contract pacts and help further Diversity & Inclusion goals embraced by public plan sponsors, issuers of corporate, federal, state and municipal market securities, and institutional investors. Mischler’s first constituents were comprised of a discrete universe of those who advocate the engagement of qualified minority-owned broker-dealers. At the outset, a select group of corporate clients engaged us to assist in their issuing and distributing new securities within the debt and equities capital markets; state and local governments enlisted us to advance municipal debt offerings, and investment managers, including public pension sponsors, looked to Mischler to facilitate direct market access to fixed income and global equities markets. Today, the Mischler Financial Group platform is recognized by a broad spectrum of public company corporate treasury teams, municipal debt issuers, and leaders from the financial industry’s buy-side and sell-side. We are a compelling partner not only because of our legacy, and not only because we are viewed as a pure complement to the role played by Issuers’ primary investment bank(s). We are engaged by Issuers and investment managers because we are an aggressively-competitive boutique whose peers include the industry’s most-recognized investment banks, order execution firms, media-quoted market strategists and institutional brokers. Our time-tested and well-proven capabilities extend across the most critical areas of the financial market landscape: (i) the primary government and corporate debt and equity capital markets, and (ii), the secondary market trading ecosystem for both equities and fixed income. We deploy a combination of high touch and high-technology trading tools to provide public pension plan sponsors, institutional investment managers, Fortune Treasurers and select hedge funds with granular market insight and best execution in US and International Equities, ETFs, and a full array of Fixed Income-centric products. Mischler’s 24/6 trade execution desk provides an expert voice complemented by reliable and robust trading technology that provides direct market access and seamless, straight-thru processing in the course of trading US domestic and international equities and a full menu of fixed-income products. Mischler Financial also exceeds the execution and post-trade analysis needs of corporate treasurers engaged in initial public offering (IPOs) and the open-market repurchase of their company’s shares via (10b-18) buyback programs. Notwithstanding our 20-year ascendancy from being a small, regional minority broker-dealer to our current ranking among widely-respected Wall Street firms, we remain dedicated to our legacy by advocating on behalf of disabled military veterans and their family members who seek equal opportunities in which they can leverage the training, disciplines and skills acquired while they served in the US Military. Our daily priorities are equally-focused on serving our clients, our team members, our constituents and our families in a manner that exceeds all standards, and most important: each of their expectations. Our corporate mandate inspires us to continuously give back and pay forward to support those who valiantly served our Country in their pursuit of equal opportunities and the American Dream. 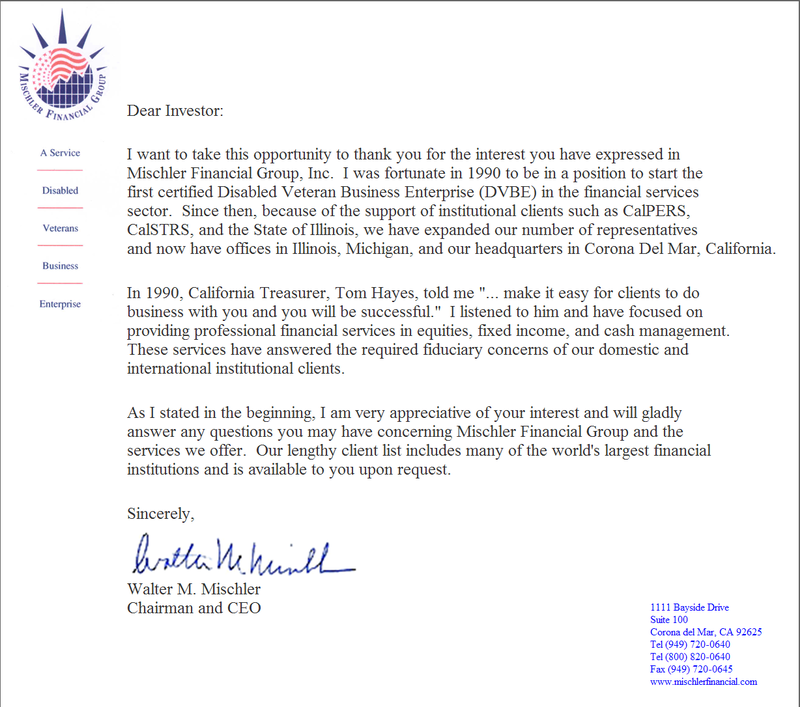 We take exceptional pride for being recognized as a fully-accredited, Service-Disabled Veteran Business Enterprise (SDVBE)* by the U.S. Department of General Services Office of Small Business Certification and Resources, the California State Treasurer’s Office, New York State Office of General Services, and various other state agencies throughout the United States. Through this designation, one that our founders literally fought with their lives to earn, we offer a unique capability for government entities, public corporations, insurance enterprises, fund management concerns and non-profits to fulfill their regulatory requirements, mandates and fiduciary obligations that are specifically intended to honor and support service-disabled veterans who seek to achieve the American Dream. We look back to learn so that we may continue to lead.